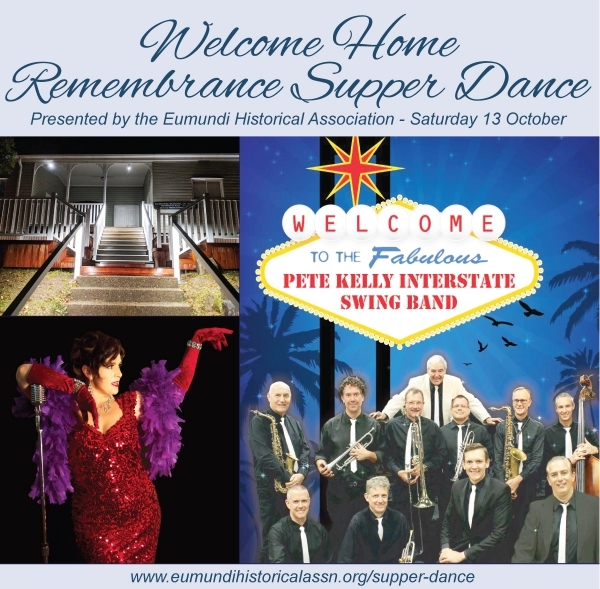 To commemorate and celebrate the 100th Anniversary of the ending of WW1 Eumundi Historical Association is presenting a Supper Dance, in a style reminiscent of supper dances held in the Eumundi School of Arts hall to celebrate the return of Eumundi men after the war ended in 1918. Enjoy some wonderful old time melodies from the 10 piece ‘Pete Kelly Swing Band’, ably supported by singers Melissa Isles and Carl Beck, with a nostalgic supper by 'Free Ranging Chef' Peter Wolfe of Cedar Creek Farm Bush Foods. Polish up your dancing shoes and dust off your glad rags for a great night out. Arrive by 6.30pm to find a seat as canapés will be served to your table by 7pm. Drinks available for purchase at the bar. Early bird tickets available until 1 October - save $10 per head. Early bird $40 after 1 October $50. Ticket includes entertainment, 3 course supper and lucky door prizes. Contact the host to confirm booking.